Have you ever found a food item buried in the bottom of your freezer and wondered if it was good to eat? How does your freezer work? Why can you freeze food and it not rot? Omega Force Services in the Twin Cities offers appliance repairs, including freezer repair. We know that many of us couldn’t live without our freezer. If you think you go to the grocery store too often now, think how many MORE times you’d have to go if you didn’t have a freezer. 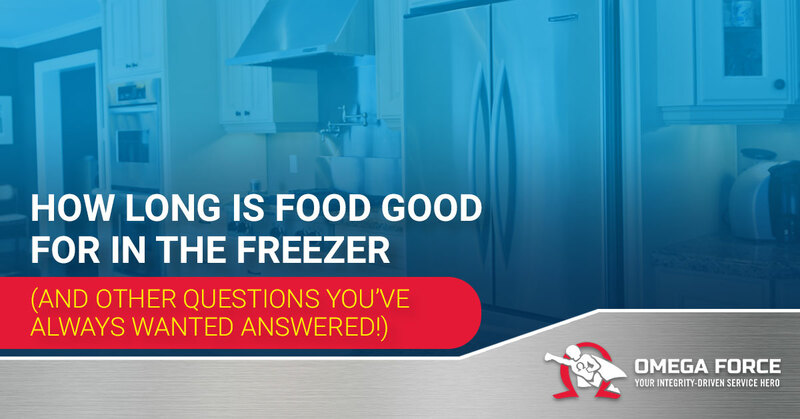 In this blog post, we’ll explore answers to your frequently asked questions (or at least, your kids’ frequently asked questions) about how freezers work, why they work, and how long you can freeze food for. Contact us today for all of your freezer repair or appliance repair needs! WHY DOES FREEZING FOOD WORK? To answer this question, we’ll have to answer another question: why does food rot in the first place? When food is harvested, either from a plant or from an animal (that is, it is killed), the plant or animal dies. As part of the cycle of life, as soon as something dies, microbes immediately begin to break it down, so it can return to the earth. This is a part of life and keeps the earth from being littered with dying organisms. It’s really beautiful actually how the life cycle works. The causes of decomposition are air, moisture, light, temperature, and microbes. Microbes do most of the work, with oxygen and moisture aiding the microbes in their job. Light also contributes to degradation due to the power of the sun’s rays. The sun’s rays raise the temperature of the organism that is being broken down, which speeds up the chemical processes of microbes (hence the importance of refrigeration and freezing). Not all spoiled food is bad. Think about cheese; it’s soured milk made to taste good! That answers part of our questions. Before the advent of refrigeration, meat had to be consumed quickly or salted so it wouldn’t spoil. If we eat spoiled food, the bacteria present on the food can make us sick. Salt does in effect what refrigeration does in terms of preserving food. However, it draws out the moisture content in addition to killing bacteria. This makes meat preserved in this way hard and, well, salty. Today, we understand that it is the moisture content that contributes to food decay. Hence, when we freeze food, the growth of these microorganisms is stopped. Oxidation can still occur if the frozen food is exposed to air, but this won’t harm you. Enzymes also stay active on frozen food but does not harm you either. Freezing food is the easiest and most convenient method of preserving food. It’s also quick: buy your food, throw it in the freezer, and forget about it until you want it. One caveat: try to freeze food as close to death (to put it bluntly) as you can to minimize microbial growth, which is still present in frozen food, and will become undormant upon un-freezing. Freezers use a refrigerant (freon or ammonia) which travels to a compressor, which causes hot gas. The hot gas moves through coils, making it cool. The gas is now turned into a liquid, forced into an expansion valve, and turned into a very cold mist (which is what you see when you open your freezer). The mist is then turned back into a gas at around negative 27 degrees Fahrenheit and takes the heat from the freezer compartment with it. This heat causes the refrigerant to warm up again on its way back to the compressor to start the cycle all over again. This process continues until all of the heat in the freezer compartment is expelled, resulting in frozen food. The thermostat in the freezer tells the freezer when to start the compressor and when to stop it. This is one of the most common repairs on a freezer repair job that Omega Force Services sees. When your freezer doesn’t work, the compressor either won’t stop running or doesn’t run at all. This freezing process should be seamless and unseen. If you see fluid at all leaking in your freezer from any components, call your local freezer repair ASAP. The refrigerant substances (freon and solid ammonia) are very toxic and should not be touched by an untrained professional. HOW LONG CAN YOU FREEZE FOOD FOR? The short answer is infinitely. As long as your food wasn’t spoiled when you froze it, frozen food is always safe to eat. Dates given on packaging are for quality only since as we’ve discussed other processes are still at work on your freezer food. Freezer burn does not make your food unsafe to eat; it only makes it dry. Cut that part off before cooking for optimal taste. Interestingly, you can freeze almost any food, the exceptions being some canned foods and eggs in shells. It’s important to note that just because you can freeze food doesn’t mean you should. For example, freezing your spaghetti sauce might not taste the best unfrozen. However, freezing your wedding cake that you couldn’t eat all of is a good idea (and something you definitely should do so you can have a piece on your first anniversary)! In the refrigerator. This is the safest (albeit slowest) way to dethaw food. However, the advantage to dethawing food in the refrigerator is you don’t have to cook it right away. You can also re-freeze this defrosted food if you change your mind. In cold water. Place your food item in a resealable plastic bag. If the bag leaks, bacteria from the air could infect your food as well as having your food emerge water-logged. This will dethaw your food much faster than in the refrigerator. Be sure to use only cold water as hot water can heat up your food, reawakening bacteria in the food. This food, however, will need to be cooked right away as well. In the microwave. The fastest method of dethawing food is the microwave. Use the defrost button your microwave or about half the normal cooking power. This uses much less heat than cooking, and is thus much safer. When you dethaw food in the microwave, cook immediately because some of the food may have begun cooking already if left in the microwave on defrost mode for too long. Omega Force Services proudly serves the Twin Cities area with the best appliance repair services. From fridge repair and freezer repair to microwave repair and dishwasher repair, Omega Force makes it our mission to repair your appliance timely and efficiently, so you can get back to utilizing modern technology. We do all we can to exceed your expectations with our appliance services. From diagnosing to repairing, we make sure your appliance is in working order before we leave if we can and make sure parts are ordered if not. Appliances including your freezer are amazing pieces of technology that make all of our lives easier, which allows us more time to spend with friends and family doing the things in life we enjoy. Omega Force Services wants to take this opportunity to remind you of the importance of routine appliance maintenance care. You should have your dryer vents cleaned at least once a year, which prevents possible fires from occurring. Your refrigerator and freezer should be inspected for leaks and your refrigerator filter changed as well on a routine basis. Your dishwasher should be cleaning your dishes and your microwave heating your meals. All of your appliances should be in working order. At the first sign of trouble, it’s best to hop online, visit our website for troubleshooting tips, and if in doubt, call us for a service repair. It’s best to catch appliance repairs at the first sign of trouble rather than wait and more damage is done. Call Omega Force Services today for all appliance repair needs!